1. Spread each tortilla with 1/2 tablespoon mustard. Arrange half of the romaine leaves and six slices of turkey on each tortilla. 2. Top each sandwich with half of a sliced tomato, 1/4 cup Mozzarella shreds and fresh basil leaves. Season with freshly ground black pepper to taste. 3. 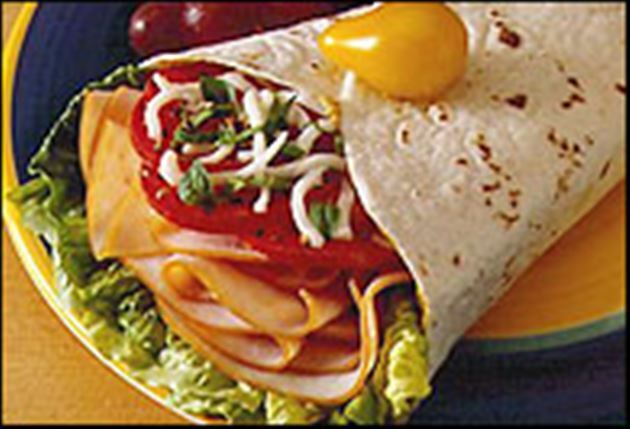 Fold the bottom 2 inches of the tortilla onto sandwich filling; roll up from side to side and slice in half before serving. Enjoy this delicious turkey tortilla wrap Mexican recipe!